I was asked to create an awesome splash screen for a web site, so I came up with this. What do you think!? Also, instead of doing it in Flash, I might just make a static image file. 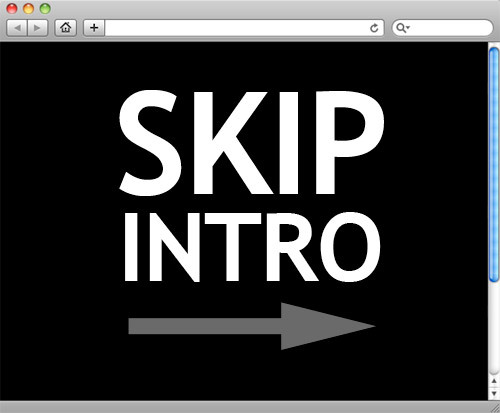 I’m not sure if I should add a “skip intro” link underneath it though, for people who don’t want to see the intro. But I really want people to see the intro… do I leave out the “skip intro” link!? Posted on Friday, March 11th, 2011 at 1:00 pm. Subscribe to the comments feed. Both comments and pings are currently closed. Post on your own blog.